The emerging number of various cyber threats threatening Internet users every day. New malware samples are being released every day to harm devices and steal data. In addition, Trojans, adware, ransomware, spyware, PUPs and other malware attacks are on the rise. Even though some users claim that they do not need antivirus software, and many of the threats may seem harmless, it is worth mentioning that cyber threats can cause a lot of damage to your device or/and sensitive and personal information. This is why decent and reliable security software is a must. Researchers at Reviewed by Pro constantly test and review Security solutions, so users can choose the right application that fits their needs. If you are trying to choose between two reputable security providers Kaspersky and McAfee, continue to read the article. Kaspersky offers more flexible plans. Both providers demonstrate superior detection rates. McAfee has a wider selection of features. McAfee has a more convenient interface. McAfee has a bigger market share. Kaspersky is developed by a Russian multinational cybersecurity company, Kaspersky Lab. The company was established in 1997 and since then provides award-winning security products for both, individual users and businesses. Kaspersky works with premier software and hardware to deliver its customers the best security solutions across all the major operating systems, including Kaspersky Anti-Virus for Windows, Kaspersky Internet Security for Android, Kaspersky Internet Security for Mac, and iOS devices, password management, endpoint security, and other cybersecurity products and services for customers and businesses (Kaspersky Small Office Security). McAfee is developed by one of the well known American-based cybersecurity giant McAfee, Inc. The company is headquartered in Santa Clara, California. McAfee is one of the most experienced players in the market and was founded in 1987 by John McAfee. In 2011, McAfee was purchased by Intel Corporation. The antivirus provider develops advanced security solutions to individual users, small and large businesses, enterprises and governments. McAfee offers a range of products for Windows, Macs (McAfee Total Protection for Mac), Android (McAfee Mobile Security & Lock for Android), and iOS users, it also provides security solutions for endpoints, networks, and cloud from viruses, malware, and other security threats. Kaspersky also provides a free 30-day trial version, to try one of the Kaspersky products. Meanwhile, McAfee lets users choose from the following two packages. 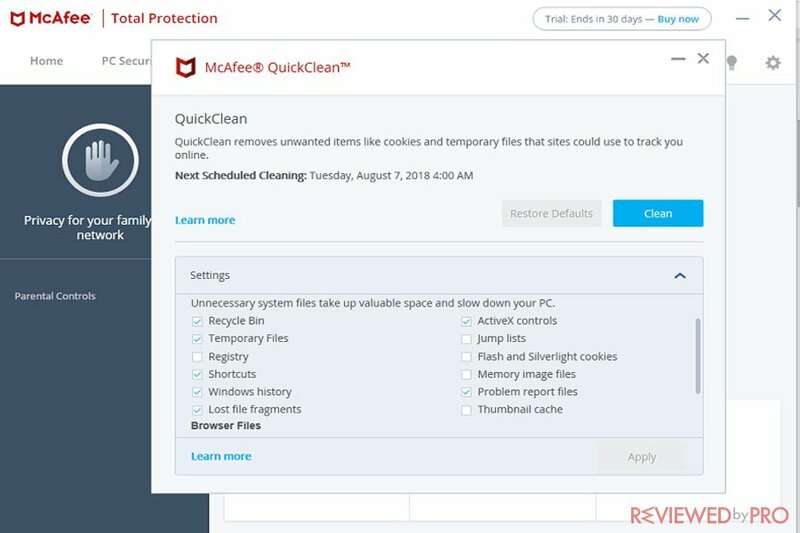 McAfee offers a 30-day free trial, so users can try the software before purchasing it. As was mentioned before, Kaspersky offers Windows users various packages including Kaspersky Anti-Virus, Kaspersky Internet Security and Kaspersky Total Security. 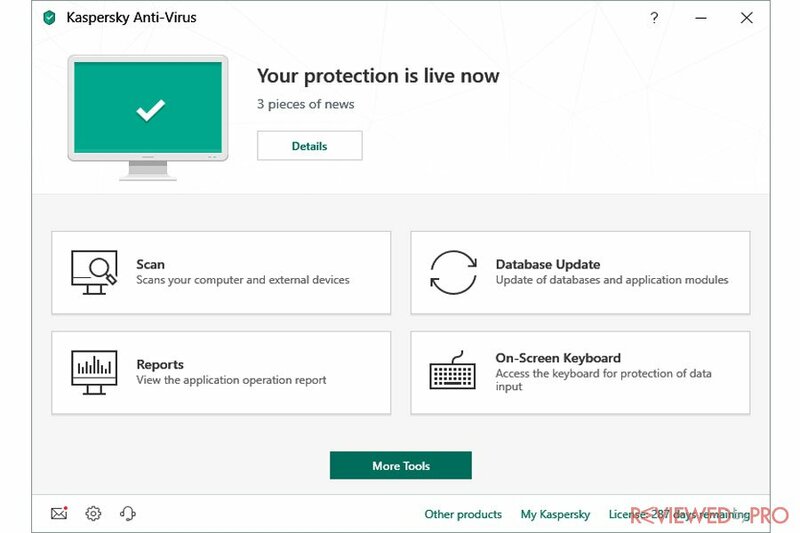 Kaspersky Anti-Virus delivers essential virus protection for PCs and includes basic features, such as Security, Performance and Simplified security management. Kaspersky Internet Security is developed to provide users with security that also protects privacy and can cover multiple devices. It includes all the Anti-Virus’ features and is compatible with PCs, Mac, and mobile includes privacy feature and protects users while they are shipping or banking online. Kaspersky Total Security is a premium package by Kaspersky and also includes Parental Controls, Password Manager and File Protection. When it comes to McAfee, it also develops various tools for consumers, including Identity Theft Protection, TechCheck, Tune-Up, Virus Removal Service or more. McAfee Total Protection offers protection up to ten devices and also comes with separated licenses for Android devices, Macs, and iOS handsets. 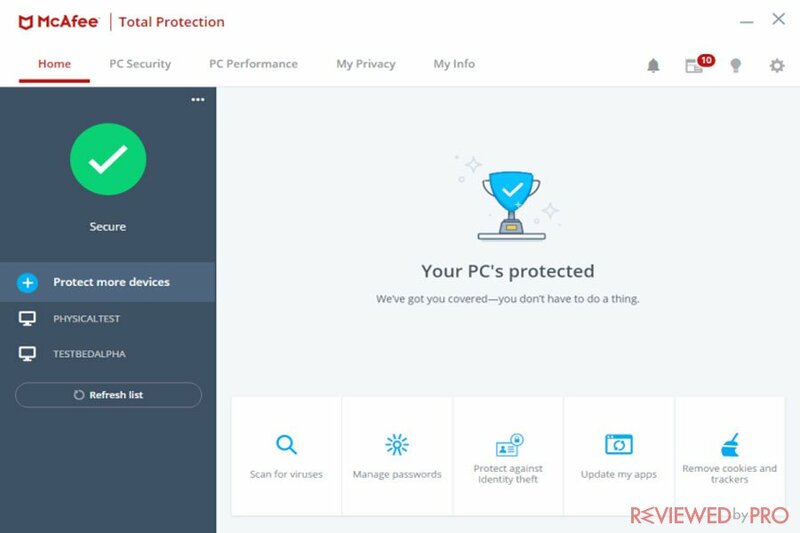 It delivers a premium feature set including antivirus, anti-malware, anti-ransomware, performance features, Firewall, Network Monitoring, ID Theft Protection, Parental Controls, and others. McAfee LiveSafe adds the same Premium features and can cover an unlimited number of devices. As you can see, McAfee provides a slightly more generous feature set and great plans for families and household. However, those who look for basic protection, Kaspersky offers basic antivirus packages at a reasonable price. Kaspersky applies popular antivirus technologies. Just like McAfee, both antivirus systems combine a digital-signature matching engine with heuristic monitoring. Utilizing these two methods, the antivirus systems are capable of detecting both, known and previously unseen malware threats. All suspicious items are sent to cloud-based servers for further investigation. Kaspersky has detected all the threats we have installed in our test PC running Windows 10, while Panda missed some malicious samples. The independent AV-TEST testing lab tested Kaspersky in its the most recent tests. Kaspersky demonstrated one of the best malware detection rates and detected 100% of both, zero-day malware attacks, including web and email threats and 100% of widespread and prevalent malware. McAfee utilizes multi-layered protection, including a traditional malware-signature engine that looks for suspect code against a database of widespread malicious icons and behavioral monitoring and reputation which detects previously unknown malware. All suspicious icons are uploaded to the company’s Threat Center for further investigation. This new technology has replaced the earliest less efficient engine in 2017. McAfee demonstrates decent antivirus protection rates. It detected all of the malware samples installed on our test computer. In addition, the company was tested by German-based independent testing lab AV-TEST. According to its latest test conducted in December 2018, McAfee detected 100% of zero-day malware attacks and 100% of widespread and prevalent malware. Both antivirus providers demonstrate excellent malware detection rates. According to our test results, Kaspersky Anti-Virus can slow down your system by a maximum of 10 percent, which is a perfect score. In addition, AT-TEST also rated Kaspersky 5.5 out of 6.0, as it delivered better results than the industry average. The first scan took about 30 minutes, the subsequent scans were finished in less than ten minutes, which is pretty fast. In addition, its quick scan only took about 2 minutes to complete. During the full scan, the OpenOffice tool finished about 30% slower than the baseline, which is in the middle. When it comes to system performance impact, McAfee has a minimal impact on computers’ performance. We did not notice any interruptions or slowdowns while using the software in the background. In addition, even during scans, the application did not cause any inconvenience. According to AV-TEST latest tests, the McAfee demonstrated better performance rates than the industry average. Impact on a system when launching popular websites – 7% (19%). McAfee Total Protection took a relatively small toll on performance during a full active scan. The performance declined only by 14%. However, the first full scan tool for more than an hour, and the second just more than 45 minutes. As you can see, McAfee demonstrates better performance scores and results. It also offers quick scans without a negative impact on a system. Kaspersky has a modern design and the user interface is easy to use. However, despite this, there is an issue with the navigation. If you move away from the Home screen, you will not have many choices – to use another feature, you will have to press ‘Return’ and only then you can choose another option. Even though McAfee used to have a pretty dark user interface, in the most recent versions the interface was updated and now looks bright and light. When it comes to options, all the main features appear in the main window, so it is easy to navigate and understand. Even though both interfaces are bright and modern-looking, we would say that McAfee's design is more user-friendly and intuitive. When it comes to Kaspersky, users can easily contact the support team via My Kaspersky, email or phone. In addition, for those, who prefer looking for information themselves are provided with a very informative support webpage that includes Knowledge Base, How-to videos, forums, and FAQs. Meanwhile, McAfee offers customer support via live chat and phone available 24×7, and it offers users to connect the support team on social media, such as Twitter, Facebook, and Youtube. The official support site is also very informative and offers a virtual assistant for guided solutions, community forums, knowledge base, FAQs, and other product-related information. In order to test the popularity of the brands, we have checked the OPSWAT Windows Anti-Malware Market Share Report that lists ten of the most popular names in the Internet security industry. According to the report, McAfee appears in second place with 12.58% of the market share, while Kaspersky Lab is only the seventh with 6.65% of the market share. Other popular names in the report include Avast, Malwarebytes, Bitdefender, ESET, Webroot, Safer Networking Ltd with SpyBot Search & Destroy, Avira, and Symantec with Norton. Kaspersky is also one of the best choices in the market. However, its interface could seem a bit confusing and it does not offer a VPN service or flexible plans. McAfee is user-friendly software with a nice interface and many features. Additionally, it has superior malware detection rates and low impact on system performances. We recommend this package for families and households with many devices that want an optimal choice for their safety. Kaspersky and McAfee both provide reliable antivirus protection and advanced features. According to the latest test results, we recommend users McAfee, since it provides very decent antivirus protection rates, a full-featured package with a minimal impact on a system at a very reasonable price. ^ Kaspersky Home Security. Kaspersky. ^ Windows Anti-malware Market Share Report. OPSWAT. 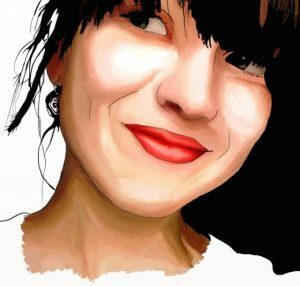 This entry was posted on 2019-02-14 at 03:24 and is filed under Security.